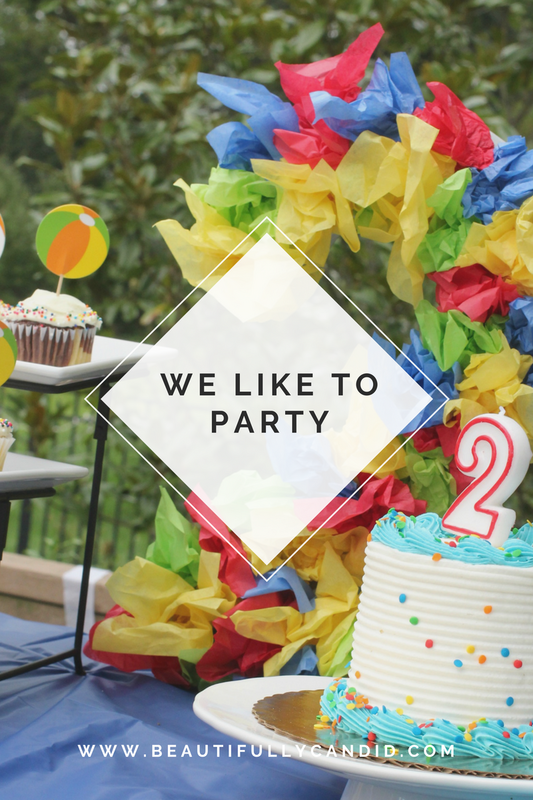 With little nugget's third birthday coming up this weekend, I thought it was the perfect time to finally join the lovely ladies of the Blended Blog for their August party edition. I seriously can't believe how fast time flies and that we are celebrating another birthday. It seems like just yesterday we were having a ball at his two year old beach ball party (pun intended). is it sad that I can't really remember a lot of my birthday parties as a kid? I do remember one, it was a surprise party my parents had for me and I remember feeling really embarrassed when I walked in and knew that I never really wanted a surprise party again. All of our parties where always at home, with homemade cakes, party decor, and I really just remember running around with my friends and having fun. I do remember for my 13th birthday my parents took me and my best friend to medieval times which was really special because we didn't live up that way at the time. After that, I don't think I had a lot of parties as a teen and it was more picking a few friends to go to a water park with us, or the beach, more day trip events then all out parties. Maybe that's why I enjoy experiences more than actual gifts? Who knows. Pinterest worthy parties didn't really exist back then and I still don't know if that was a good thing or a bad thing. well from the title of this post you can probably tell that I love to entertain. I always joke around that if I could make a living off of throwing parties I would. Ok. maybe more like just coming up with the decorating part of it. I really do enjoy it, and have fun with it. Random fact, all of our birthdays span the months from August-November with each of us having our own month. That will change when baby boy and Eric both share November. I kind of get antsy the rest of the year with no other birthdays to plan. That's why you'll randomly see some pop-up small party that I'll do for the boys throughout the year. really any excuse for a party is a good one. I love a good themed party or one that has a general focus. Whether it be a color palette, food theme, etc. Maybe that also stems from my sorority college days when pretty much every mixer had a theme. Thankfully there are ways to archive those photos now on facebook, so let's focus on some of my kids cute parties. Some of my favorites that we've done for the boys have been A's camping themed first birthday, his paw patrol pumpkin themed fourth birthday, little nugget's gender reveal, his nautical first birthday party, his baby dedication, and his beach ball themed second birthday. As you can see, I like to think I've gotten better with parties over time and the picture taking skills have improved, somewhat. I also have goals of throwing fun backyard brunch parties with friends and a New Years Eve Gatsby style party, once we get settled into that dream home. the older I get the more I love smaller intimate parties. There's something about being able to actually talk to your guests and socialize with them instead of feeling like you couldn't even get to everyone. Then, at the same time, it's also nice to have everyone in the same space, so a larger party has its advantages too. 5. FAVORITE THING TO DO AT PARITIES? I love finger foods and things that are easy to eat. At parties, most people want to be able to sit around and talk. I love something that isn't going to be hanging out of my mouth or dripping down my clothes to ruin that party outfit. I don't need anything too fancy, give me a slice of good old vanilla with chocolate icing or red velvet with cream cheese frosting, and I am just in heaven. it depends on the party. I feel like every party I decide to have balloons at it ends up being a windy day and they become more annoying than anything. I do like the mylar balloons now that come with the little stick for you to blow up and don't need helium. I can get down with them. ohhh this is a good one. hmm, this could go so many ways. I always get excited when a classic comes on like Bon Jovi or Journey, but then I also get excited when Bill Biv DeVoe-That Girl Is Poison, any Taylor Swift Song, Party Rock, or Trey Songs-Say Ah comes on. I'm just all over the place. As long as it's a good song it doesn't really matter to me. I'd love to hear more about your party style and what some of your favorites are?